Spotted dead nettle is considered a culinary herb. Unlike nettles, it does not sting nor irritate the skin (hence the reason for the name dead) and it is generally more recognized as a groundcover in gardens than a wild edible. It comes up strong in the spring and somewhat hibernates during the summer heat, but often rejuvenates in the coolness of autumn. This plant is a perennial that is considered a semi-evergreen. Distinguishing Features: The pink petals of the flower are uniquely shaped as it has a ‘hood’ top and lipped bottom. Leaves are very distinguishable as they are green with a mottling of blue-silver. It’s low growing foliage forms clumps from which emerge square flower stems. Flowers: Shell pink, pink flowers that bloom in May and sporadically throughout the summer, well into autumn. 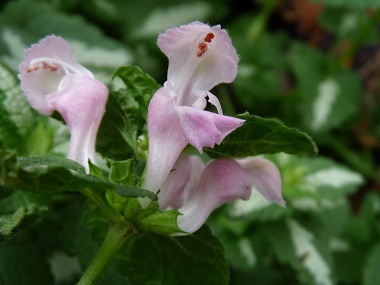 Prominent hooded upper petals and lipped lower petals are characteristics of the Mint family. 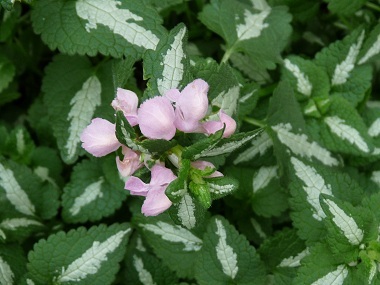 Fields of Nutrition has medicinal benefits and vitamin/mineral content of Spotted Dead Nettle. 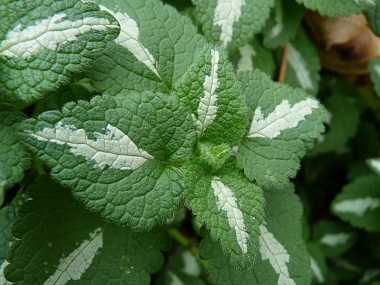 Leaves: Spotted dead nettle’s green leaves have a blue-silver mottling in the centre of each leaf. Leaves are opposite and ovate-shaped. Height: This plant is groundcover and is often 20 cm or so above soil level. Habitat: Although spotted dead nettle can be found in gardens, they also are in shaded/forested areas as they like rich soil. Edible parts: Leaves and flowers can be used. They can be used to make an herbal tea. Add leaves and flowers into a salad, stews or soups. Chopped up finely, they can be added to mashed potatoes. 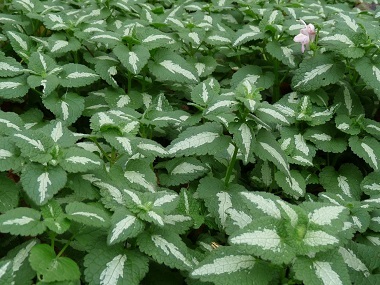 Similar plants: Red Nettle, White Nettle.